Organic. Made with love. Handmade in Devon with loving care. Gluten free. Suitable for vegans.Love is meant for sharing! This handmade Nut Roast is Organic & Vegan, and is free from Gluten, Wheat and Dairy. We're rather proud of it - if you love it too, please let us know and tell your friends! 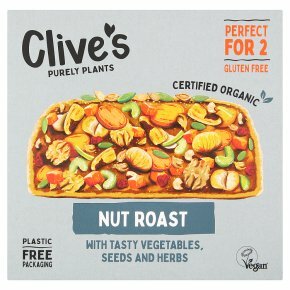 This Nut Roast serves two But if you're absolutely ravenous then you can enjoy a whole one to yourself. Straight from the box if you fancy! Eating This Nut Roast is cooked and ready for you to eat. Enjoy hot or cold, either with a delicious side salad or as the star turn in a memorable Sunday roast. Remove all packaging & place on a baking tray in the centre of a pre-heated oven.Allow to rest for a few minutes - then enjoy!